The purpose of this short study is to lay the foundations for an index of the professional photographers working in the Stroud area before the Second World War. My research was based on two main sources, surviving examples of photographers’ output and trade directories. Some work was also carried out on National Census Returns for the period 1851 – 1891. Clearly, however, for a study of this subject to be definitive, detailed analysis of newspaper archives, probate and other classes of record would also be necessary. Within the time currently available this has not been possible. However, it is hoped that future students of local history will build on what is included here. Additional information will be most welcome. while the picture and the message had to share the space on the other side. This concession, of course, led immediately to a huge increase in the manufacture of picture postcards and encouraged large numbers of photographers, nation-wide, to produce them professionally. In using the index the following points should be noted. 1. In order to make clear the extent of a photographer’s output, his work is listed on a scale ranging from rare to prolific. 2. Many photographs carry no photographer’s signature, so their origin must remain unsure. 3. 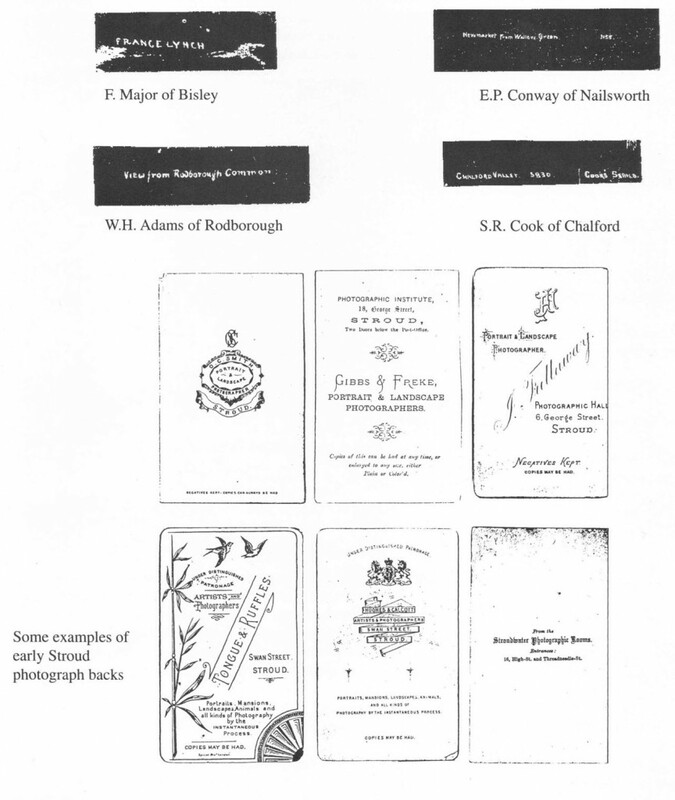 Some photographs carry only a set of initials, or unknown handwriting. Such examples have not been included. professionally they are listed below, although they will have earned their principal income in other ways. 5. The name printed on the reverse of many postcards is that of the publisher or vendor. If it has not been possible to prove that he was also the photographer, his name has been omitted. Ainsworth describes himself as ‘West of England Photographer’. The location of his studio is not known, but a few photographs of Nailsworth people and locations exist. Rare. Information from newspaper advertisement. No example seen. Born c. 1853 Nailsworth, son of John Elliott, later printer and stationer of Stroud; in 1881 working for E.T. Gibbs; studios in George Street, Union Street, later at 10 Russell Street. Prolific. Born c. 1831 Dursley; 1861 draper, High Street, Stroud; 1863 studio at 6 George Street, later 7 George Street; 1891 living at Callowell; appears at an earlier period as Stroudwater Photographic Rooms, 16 High Street and Threadneedle Street. Prolific. Born c. 1841 Canterbury; 1881 living at same address as J.H. Elliott, probably working for him; studios at 18 and 19 George Street, Stroud, later also at 123 Southgate Street, Gloucester; the back of one photograph back says Gibbs and Freke. Prolific. This group of photographers might be called the Swan Street Group, since they all worked there in various combinations and signed their photographs as follows: F Hughes, Hughes and Calcott, Calcott and Tongue, Tongue and Ruffles, W.H. Douglas Pym. All are uncommon. Worked from addresses in Bath Road, Anchor Road (probably the same building) and 6 Slad Road. Rare. Listed at Nailsworth in 1889 directory; the back of one photograph says 7 George Street Stroud. Rare. Studio at 24 London Road. Only one example seen. Traded as Merrett Brothers; George left the business in the 1890s; business began in Exchange Buildings, a wooden structure in the Corn Exchange yard off the High Street; later at top of Russell Street; additional premises at 7 George Street; Mark retired in 1923, but continued business for some twenty years in his home in Belle Vue Road. Prolific. Younger brother of George and Mark; also worked at Gloucester; studio in Lansdown. Stroud work uncommon. Pym, W.H. Douglas. Stroud c. 1885? (See Hughes F) Only one example seen. Born c. 1833 Germany; also teacher of languages, music and drawing. Rare. Listed in Union Street in 1885 directory; worked earlier in Swan Street; (see Hughes, F.). Rare. Born 1812 London, died Stroud 1876; better known as an artist; father of Oliver C. and Paul L. No example seen. No proven relationship with other Smiths. Prolific. Born c. 1839 Ebley; son of Alfred Newland Smith; 1861 lodging in Bath Place with brother Paul L.; premises in London Road, later 18 George Street, later still 3 and 4 Lansdown; died 1884; his widow continued the business up to c. 1889. Prolific. Born 1845 Woodchester, son of Alfred Newland Smith; educated South Kensington; worked part-time as a photographer; also teacher of chemistry and natural history; lecturer at Cheltenham Town Hall; died 1932; 1880s output appears to be from Stonehouse premises, later work from Nailsworth; photographs almost invariably cabinet-size. Prolific. Worked as Tongue and Ruffles, Calcott and Tongue; (see Hughes, F.). Rare. Born Stroud 1884; died 1967; unsigned topographical postcards of the Stroud area; (for further information see ‘Five Stroud Photographers’ , Chalford Publishing Company 1995). Prolific. Premises known as Paris Studios. Rare. Printed postcards are prolific; real photographic topographical output rare; based mainly in Gloucester, but one photograph says Painswick. Studio at 7 George Street. Uncommon. Listed in trade directory. No example seen. Listed in trade directory at 11 Lansdown. No example seen. Believed to be successor to Mrs C..A. Dover q.v. ; moved later to Swindon, Wilts. Also known at Marlow, Bucks. Prolific. County Studio, 10 Russell Street; successor to J.H. Elliott, predecessor of Peckhams; (see ‘Five Stroud Photographers,’ Chalford Publishing Company 1995). Prolific. Born 1874 Abergavenny; died 1946 Mitcheldean; lived at Locksley, Bath Road, Nailsworth; wooden studio behind number 4 Victoria Villas. Both topographical postcards and portraits prolific. (See ‘Around Nailsworth and Minchinhampton,’ Chalford Publishing Company 1994). Topographical real photographic postcards, mostly with a 4-digit serial number. Cook was prolific and covered most of the Stroud area..
Died 1916. Registrar of Births, Marriages and Deaths, Clerk to Minchinhampton Parish Council. Printed topographical postcards. Fairly common. Born 1886 Cardiff; died 1965 Kingswood, Bristol; printed postcards common; studio portraits rare. Real photographic postcards uncommon. Portraits produced as a side-line by the well-known Stroud drapery firm. Uncommon. Born c. 1874, died 1957. Name impressed into real photographic postcards, but no mention of Eastington. Fairly common. Lived at The Knoll, Leonard Stanley. Uncommon. Several postcards of Leonard Stanley exist and include the initials G.V.L. Although they are of the neighbouring village it is assumed that they belong to G.V. Liddiatt who ran a cycle dealership in Kings Stanley. Rare. Major produced two series of postcards, the printed ones signed. Real photographic postcards are recognisable by his distinctive handwriting on the fronts. Both series are common. Studio in Horsley Road. Rare. Worked mainly in Cirencester; in partnership with his son-in-law, Edwin C. Peckham, in Stroud; after 1929 Peckham continued the business in his own name; studio in King Street 1920;by 1924 at 10 Russell Street. Common. Born 1887 Cirencester; studio in King Street 1920 in partnership with his father-in-law, W. Dennis Moss; moved to 10 Russell Street in 1924 and continued the business in his own name from 1929; topographical views, portraits and postcards. Prolific. Also worked at Cheltenham. Stonehouse work is rare. Postcards say simply Restall, but are thought to be the work of Gilbert Restall, who was licensee of The New Inn, now The Stirrup Cup. Fairly common. Successor to H.J. Cornley; succeeded by W. Dennis Moss and Peckham. Uncommon. Real photographic postcards, thought to be the work of R.H. Stephens. Uncommon. Trade directory entry. No examples seen. Adele, born Ada Ellen Barnes, at Ashford, Kent, 1866; George Stone, born 1864; worked for Ada’s father at his photographic business; George and Adele worked in Devizes, Leamington Spa and Swindon before moving to Stroud; studio at 56 London Road; George died 1942; Adele died 1949. Prolific. Real photographic postcards. Fairly common. Real photographic postcards. Young was probably a photographer, though it is possible he merely published the postcards that bear his name. Rare. I am grateful to Wilfred Merrett for his help and advice and to my wife, Sylvia, for typing the text.